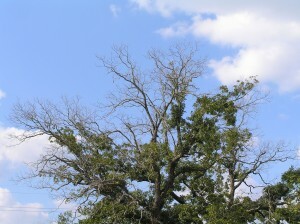 Last year’s record heat and drought compounded the severe impact that the 2009 drought had on trees in Austin, Texas. In 2009 we saw record levels of dead and declining trees due to drought. The heavy rains that occurred that fall and into 2010 were not enough to save many of the trees that initially survived. The same thing is happening now. The heavy rains of this winter were not enough to save many of the trees that survived through 2011’s drought. Now that the late-blooming species are in leaf, what is dead is apparent, and the phones at tree care services around town are really ringing. My business is about tree care, not about being a “tree mortician”. I have focused my 30-plus year career on maintaining trees and advising property owners on what they can do to preserve their trees. This means pruning, cabling, fertilizing, and other tree care techniques. I can certainly perform difficult removals, but they are not a satisfying thing for a highly experienced Certified Arborist. So, what can one do for a drought stressed tree? Well, the short answer is, unfortunately not much. If there is substantial dieback, nothing is going to bring those dead limbs back to life. Now that almost every live tree in Austin is in leaf, if it doesn’t have leaves, it’s very likely dead. 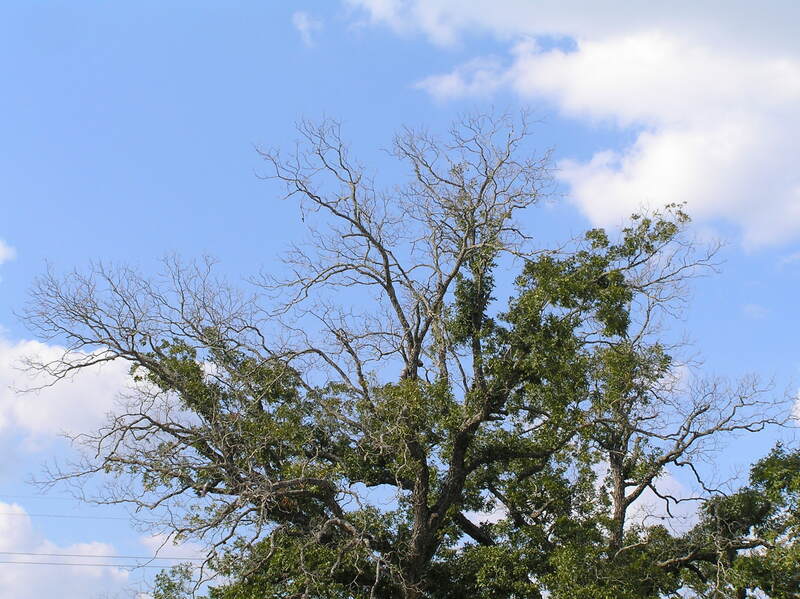 Once you know for certain that a large limb is dead, it should be removed quickly. This is for safety purposes. Some species shed their dead branches much more quickly than others. Pecan for instance can shed large dead limbs within a year, whereas live oak will often hang on to them for many years. Dead limbs really aren’t a health issue for trees in the short term (less than a year). Some tree services recommend fertilization for trees affected by drought. Although fertilizing has its place, I do not automatically recommend this. In fact, fertilizing can be harmful to a tree in a severely stressed condition. Fertilization should only be used when there is a known nutrient deficiency. This is something I always assess before considering the addition of nutrients. The best approach to trees stressed by drought is to maintain proper irrigation levels and improve soil quality. Soil improvement is largely done through the addition of organic materials to existing soils, but more aggressive mechanical means (such as an air spade) are sometimes employed for extremely poor soils. As with fertilizing, there are right ways and wrong ways to improve soils. Proper irrigation can be achieved for trees even under most stages of city water restrictions. I generally recommend a thorough soaking about once a week during the hottest months. How much time and water that will take will depend on your specific irrigation system, water pressure and soil type. A heavy soak once a week is far preferable to multiple short waterings per week. If you have a thick turf like St. Augustine grass, you may not even get much water through it and to the tree roots if you are doing short waterings, so in this situation your tree could still suffer drought stress even if you were watering every other day. I can discuss the specifics of how to best achieve these things on your property during a consultation. Another big problem that trees stressed by drought often experience is borer insect infestation. Although some aggressive species of borers can attack (and kill) healthy trees, most are opportunistic, and are more likely to attack stressed trees, and some species are more susceptible than others. While chemical treatment of these insects is possible and sometimes necessary, often the infestation is only noticed after the insect has already damaged the tree and is no longer present. Correcting the stress factor is usually the best approach. If you have trees that are in need of tree care, you will get the best results from a tree service in which the treatment is personally provided by an owner/operator who is an I.S.A. Certified Arborist with at least 15 years of local experience such as mine. I have owned and operated Arbor Vitae Tree Care for 29 years. This entry was posted in tree care and tree pruning and tagged arborist, austin, certified, tree care, tree pruning. Bookmark the permalink.